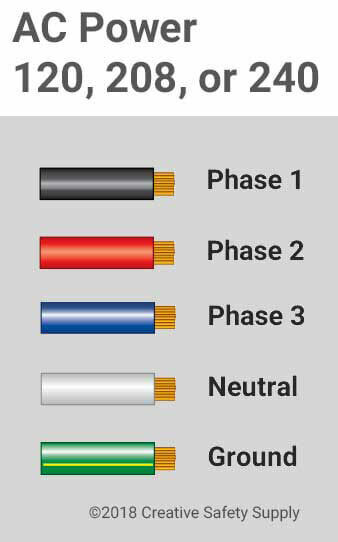 When running electrical wire, it is important to ensure the wires themselves are color coded according to the accepted standards. These colors will identify a lot of information about the wires, which is critical for safety. Electrical wire colors are life saving in commercial, industrial, and residential environments. They are especially important in commercial and industrial environments though because of the higher amounts of electricity being used. 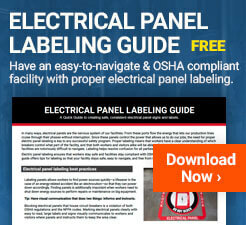 In the United States, most facilities will follow the wiring standards as laid out by the National Electrical Installation Standards, or NEiS. They offer valuable information about things like what types of wires should be used in what situation, how to properly install wires, how long different types of electrical wiring should be, and much more. They are a private organization, and don't have the ability to force any company to follow their standards or regulations. Companies typically follow standards because it is required of them by the law. When there aren't any legal ramifications for following a set of standards, some companies will look at it as an unnecessary expense. With wire colors, this isn't typically the case. Since different colored wiring all costs the same, as long as it is of the same type, there is no real downside to following the color standards that the industry has adopted. Following these standards will improve the workplace safety since most people coming into a facility will know what each color means. This will help to reduce the risk of shock, electrocution, fire, and other issues. Safety in the workplace can help to reduce expenses, reduce unplanned downtime, and lower risks of costly injuries or other incidents. These benefits all help to encourage companies to follow accepted practices that have been adopted across many industries. This applies primarily to when new wiring is being installed. Wiring can often last for many decades though, so it is always important to be aware that the electrical wire colors used by a company might not be universally in line with the standards in that area. There are many different standards in place for many different reasons. 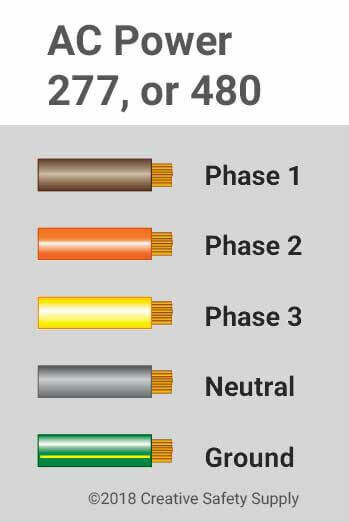 Each country will likely have its own set of electrical wire color codes that they recommend, and then there are standards like those from the IEC, which make recommendations. On top of that, standards and regulations change over time, so facilities may still be operating on older color standards for many years after they have been discontinued. With this in mind, all work environments should have the wire color standards that they are following well-documented and available. This will help ensure anyone who is coming into the facility to perform any type of work will be able to quickly determine what each wire is, and how they should be working on it. Positive - Positive wires will be red. Ground - Grounded wires will be white or grey. When working on electrical equipment, the wiring will almost always come with plastic coloring when it is purchased. The color on the wiring doesn't often change the design of the wire itself, but rather tells the person using it how the wiring should be used. Anyone who is actually installing wiring needs to take great care to follow the standards that the facility being worked on uses. 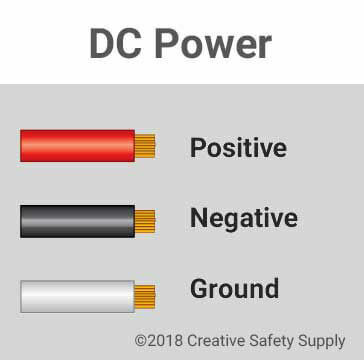 While a red wire would work a negative wire in DC current, it would be quite misleading and expose anyone who works on the system in the future to great danger. If a facility has older wiring in place that doesn't follow modern standards, there are several options available. Ideally, the wiring could be stripped out of the facility, and new wires run that follow the latest color-coded standards. This is a potentially expensive task, and one that may have to have the facility shut down for an extended period of time. An alternative option is to use wiring labels to make sure it is clear what a particular wire is for. There are many types of wire labels, and they can often be printed on to provide additional information about the wire beyond just using the color. It is also possible to use wire tape to make a specific wire a different color so that it is in compliance. Whether a particular facility is following the latest standards, or they still have some outdated wire colors in place, it is important to provide training to any employees who could work on the electrical systems. 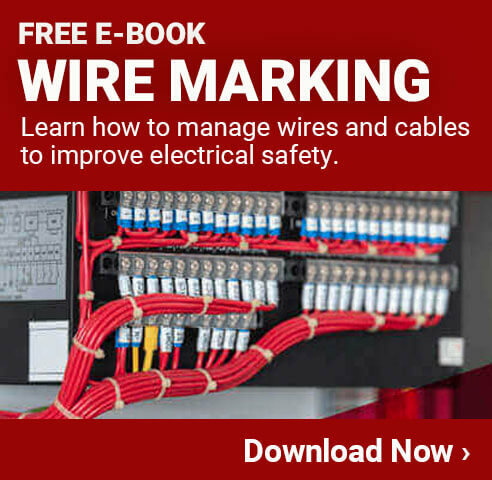 Even employees who aren't electricians may run into situations where they work with electrical wires, and this type of training could save lives. In addition, having the documentation available to provide to emergency responders should an accident occur is important. Many facilities will keep this type of information on hand at a front office, or as part of their emergency response plans, so that it can be accessed right away. The more readily available this type of information is, the safer the workplace will be. Some workplaces even create posters that show the different color of wire, and what it means in their facility. This can serve as a constant reminder to employees and anyone else who does work in the area. Even seemingly small efforts made by facilities to follow standards and improve training can help to reduce the risk of fire, shock, machine malfunction, and fatal electrocution. The fact that these efforts are typically very affordable and easy to implement, more and more companies today are taking the necessary steps to follow electrical wire color standards throughout their facility.